The new Core Rule Set 3.0 (CRS3) release simplifies ModSecurity/Drupal integration tremendously. Here is a guide aimed at the Drupal community to learn how to work with ModSecurity. This guide and the rule file it is based on currently covers Drupal Core. Modules / Plugins are not yet supported. But count on the Drupal community to help us close this wide gap. 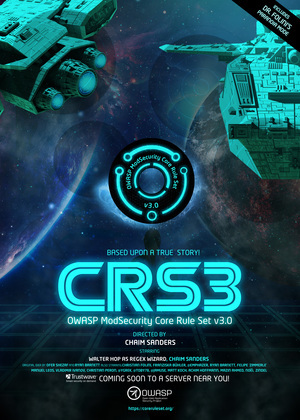 OWASP ModSecurity Core Rule Set is a horrible name for a project, that’s why we speak of CRS3. This is a security project and for those not familiar with the CRS, I will give a brief intro first. ModSecurity is an open source Web Application Firewall (WAF) meant to protect applications exposed on the internet from all sort of nastiness; namely those attacks summarized as the OWASP Top Ten. So ModSecurity is meant to protect you and your Drupal installation from SQL injections, Cross Site Scripting attacks, you name it. Drupal is a fine piece of software and the security record is quite good given it is an advanced content management system. But an in-depth approach to security will plan ahead and a ModSecurity installation will help defending against new attacks before the Drupal Security team had a chance to react. ModSecurity is the engine, but it is quite naked without the rule set. And this is where the OWASP ModSecurity Core Rule Set comes in. That is a set of 150 – 200 generic blacklisting rules to examine http traffic and decide if it smells like an attack or not. This is performed via a set of regular expressions. Some of them fairly complex and some of them giving false alarms when they see legitimate Drupal traffic. That is natural for a heuristic approach because Drupal has a few habits that make it look suspicious to the CRS3 and we need to deal with these situations. Good for us, CRS3 comes with a set of predefined rule exclusions to deal with that problem. That means that there is an optional configuration file that instructs ModSecurity to ignore certain rules for certain Drupal parameters. With 150 rules active, removing a few is usually not a big deal and certainly better than not running ModSecurity at all. We call CRS3 the 1st line of defense. It is meant to keep most of the bad stuff away. However, we have no illusions that evasion is always possible. But CRS3 makes it harder, a lot harder, for an attacker to get to your Drupal installation. 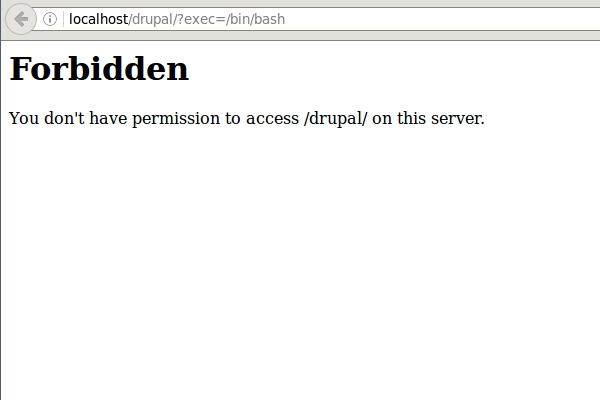 I am assuming you have Drupal already installed or you know how to do that. If not, then I suggest you check out this link. If you happen to run a long-term support Linux OS you might end up with an old Apache version plagued by a nasty bug which was only fixed in 2.4.11. If that is the case, then please look up the workaround in the KNOWN_BUGS file. The predefined rule exclusions help you avoiding blockades where you expect Drupal or your users to enter funny keywords like the one above. This means, it is OK to write about /bin/bash in a Drupal Post and the CRS will not complain. But filling the said value as your username outside an article or post will lead to the desired block. Write to me directly at folini with netnea.com. We will then try and cover the problem in one of the subsequent releases. But how about immediate help? SecRule REMOTE_ADDR "@ipMatch 127.0.0.1" "id:10000,phase:1,pass,ctl:ruleEngine=Off"
Note that there is a mandatory id being set in this declaration. This id has to be unique. If you deploy multiple declarations in this manner, you need to use different ids with each of them (Please also note that this has to be placed before the Include statement. We reserved a space in the rule file for this named CRS runtime rule exclusions). A more diligent handling of the problem involves writing rule exclusions. There is an extensive tutorial with detailed coverage summary of the problem and a good exercise following a very clear rule exclusion policy. They contain the keyword ModSecurity which makes them easy to grep. In our example, we see the rule with ID 932160 complaining about ARGS:exec (short for “parameter named exec”). This is a very simple remedy, but it has very wide consequences: It is a site-wide rule exclusion. This means the parameter exec is now ignored by rule 932160 completely. For a permanent install, I advocate a more subtle approach limiting the exclusion to certain paths or forms like outlined in the tutorial. However, the statement above this will do as a temporary bandaid that lets you continue your work. For a start with the ModSecurity CRS3, this is all you need to know. Give it a go! Was this helpful? What else should go into this document? Any mistakes? I would like to hear from you! Get in touch via email or send me a message on twitter (@ChrFolini). Otherwise, look around here on netnea.com for more ModSecurity resources and check out the courses I am offering via FeistyDuck.